I recently read an interview with Pixar executive and director of Cars 2 John Lasseter, in which he commented that he thought that a spy movie with cars would be really fun and interesting. After seeing the movie, I find myself remembering a famous quote from Dr. Ian Malcolm. To paraphrase, Lasseter was so preoccupied with whether or not he could, he didn’t stop to think if he should. I recently wrote an article about sequels, in which I state that the whole artistic point of a sequel is to follow the further adventures of a particular character. The need for a sequel flows organically out of the inherent depth of an interesting character. Too often, sequels just take the same plot of the original film, then just make a couple changes. To Lasseter’s credit, Cars 2 avoids this. Instead, it goes too far in the other direction and we wind up with a story that is so unlike that of the first film that it strains credibility. A sequel that puts the characters in a completely unlikely situation is no more organic than one that forces them to repeat the same story over and over. Nobody that watched the first Cars would ever think to themselves, “I’d really like to see these characters in an over-the-top spy movie.” Not only would they have no desire to see that, but the thought would not even occur to them. It sure didn’t occur to me. Because nothing about the characters’ lives, nor anything in the world created, would lead them to be in the midst of an action-packed spy thriller. I understand that there is something inherently strange about a world where cars talk and emote, but that doesn’t mean that there are no rules. In many ways, the world of Cars is pretty similar to our own. Characters deal with selfishness, irrelevance, and friendship, just as they do here. Which is why it is so jarring to suddenly find these fairly ordinary characters involved in an outlandish criminal conspiracy. This may still be an animated family film, but there is no denying that there is a sudden and unexpected change in genre in Cars 2. Imagine if the sequel to The Last Picture Show was Signs, with Timothy Bottoms in the Mel Gibson role. Just because it features the same characters and ostensibly takes place in the same reality, that doesn’t mean it feels right. 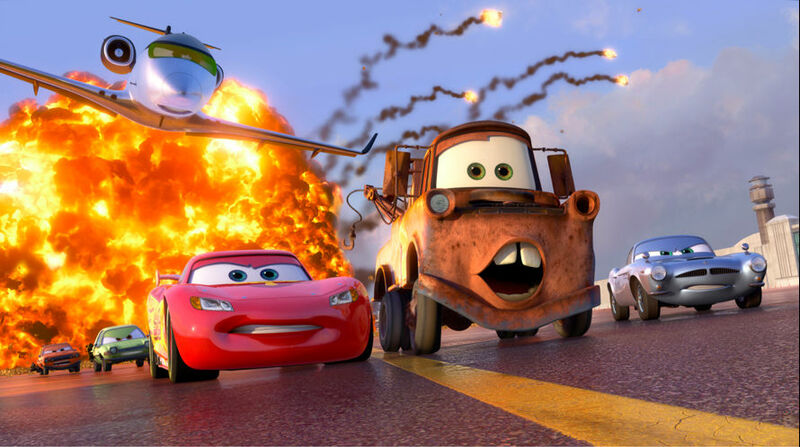 Don’t get me wrong; the action in Cars 2 is quite invigorating. The opening spy sequence is directed with the same visual panache as many modern day action films. And the criminal conspiracy is pretty clever and well executed. All of the elements are there and pulled off very well. I just didn’t care. Because I wasn’t watching a James Bond film or a Jason Bourne film. Hell, I wasn’t even watching The Incredibles. I was watching a Cars film, and the sleeker the action, the more removed I became. The film also steps wrong in bringing the character of Mater to the forefront. With Paul Newman now deceased, they could no longer rely on the central relationship of Lightning McQueen and Doc Hudson. Instead, they focus on McQueen and Mater, with the emphasis being on McQueen’s embarrassment of being friends with such an uncouth idiot. Soon enough, though, even that relationship is put on the back burner in favor of Mater accidentally getting roped in to the spy story. Of course, Mater is very stupid, but the other spies just assume that’s some sort of cover, labeling him one of the best and smartest agents they’ve ever seen. Mater eventually gets wise to how the other spies see him and heads down the path of introspection. It is in this plot development that I found myself moving beyond boredom and frustration into all-out anger. Mater’s arc is an interesting one, to be sure. The idea of a comic relief suddenly realizing exactly what role he plays in the lives of his friends can be very poignant. One need only watch Planes, Trains, and Automobiles to see just how heartbreaking it can be when a seemingly oblivious character shows that they know more than they let on. In this way, I got the sense that the film was trying to have its cake and eat it, too. They create a character that is obviously meant to be the comic relief. He is loyal, well-meaning, and likable, but he is unquestionably an imbecile. His stupidity is meant to be funny; that’s why the filmmakers put it in there. For them to suddenly wag their finger at us for doing what they themselves wanted us to do- counted on us to do, in fact- is a bit disingenuous. This is different than when a filmmaker uses extreme violence to lure us in to an anti-violence film; that is all about the film’s execution. This, however, is about the nature of a character; a character created by the filmmakers for the express purpose of being laughed at. Pixar is a fairly ambitious company. The stories they tell and the themes they explore are pretty lofty for what many would consider to be just a studio that makes cartoons. These goals often pay off in spades, as in WALL-E and Toy Story 3. Occasionally, the filmmakers bite off a bit more than they can chew- like the strange subplot about stealing in Ratatouille– but that is usually a minor speed bump in what is largely a well-executed film. Mater’s self realization and the resulting audience accountability is brought so much to the forefront of the movie that it’s hard to ignore. And it’s so poorly thought out that I found myself wondering if it was an afterthought in the writing process. Almost as if the screenwriters realized they were telling a story that lacked any depth and quickly threw in something that would make it feel a little more like a standard Pixar film. But what makes Pixar a cut above the rest is a commitment to thinking through their themes and trying to match them organically to the story they’re telling. The Incredibles explores the theme of forced social mediocrity, but couches it in a story about those that are extraordinary. The Toy Story films explore finding your identity in the midst of obsolescence, which makes sense when you’re a toy whose owner is getting older. Cars 2 tries to turn Mater’s emotional journey into a larger theme about incompetence and other people’s scorn, but that’s difficult to do when the character is in fact incompetent and the filmmakers themselves always meant for us to laugh. Cars 2 is a pretty big artistic misstep, conceived out of a director’s desire to experiment. There is nothing wrong with this desire. It is this artistic instinct that led to Pixar putting out some of the best and most provocative films in recent memory. For this reason, I am not discouraged, as so many others have been by the very existence of this film. I can forgive the occasional Cars 2 if it means I get a Ratatouille or an Up or a Finding Nemo. But, make no mistake, Cars 2 is not in the same class as those other films. It may be a necessary evil, but that doesn’t redeem it. I find myself frequently defending Cars among peers, and would rank it among my favorite Pixar movies (note: I said favorite, not best). When I heard they were making a sequel, I was somewhat intrigued, but once I found out what it was about, I found it hard to fake any sort of excitement. This whole idea seems more like a 5-10 minute Cars short, that could’ve been included on a Special Edition DVD/Blu-ray release, or shown on the Disney channel (like Tokyo Mater was). That being said, I think the Malcolm quote in the opening paragraph discredits Lasseter. A sentence earlier you mention him thinking the spy/Cars movie would be “really fun and interesting” which implies he thought more of a sequel than simply whether he could make it or not. I actually like the first film a lot more than I expected. I thought the story was very simple, yet had just as much emotional complexity as other Pixar films. Admittedly, I’ve always had a hard time really accepting the world of cars. Did humans build them? Did they build themselves? Did humans ever exist, or is this a universe in which there were only cars? If that’s the case, then why do they still look like cars, with doors and windows? The purpose of a door is to allow a person to enter. It was all very frustrating, but it wasn’t enough to ruin the film for me. I think you’re dead-on about the idea that it seems more like a short than a feature. I hadn’t thought about that, but you’re right. I’m a bit more willing- as are most audiences, I think- to accept major deviations from the normal story if it’s only for ten minutes. To devote 100 minutes, however, puts a bit of a strain on us. As for the Malcolm quote, I bring it up because I have an image of John Lasseter (a director and producer that I like and respect) sitting at home and he has a little flight of fancy. “What if we did a spy movie with Cars?” However, rather than really think through if that would be a good idea, he seemed to merely accept it as a thing he would try to do, and move on from there. We all think that certain things would be interesting, but we usually realize that they wouldn’t be at all practical, so we let them go. I think Lasseter should have let the whole spy story go. I think I mostly agree. If this spy story was the best idea they had for a sequel, I’m not sure I even want to know about the ideas that got tossed aside. Years ago when Pixar’s upcoming releases were announced, Cars 2 was slated for 2012, and Newt was supposed to be this summer’s release. With Newt canceled, Cars 2 got pushed up and I wonder how much of an affect that had on things (or whether Cars 2’s story was already set when Newt was canned). Seeing now how Cars 2 turned out (based solely on review, since I won’t see it myself until this weekend), I wonder if Newt got canceled because it was a bad idea/story, or just because it didn’t seem like a money-maker. I just wish Disney wouldn’t have sullied Pixar’s reputation with this sequel. Maybe they could have farmed it out to a different studio, and/or dump it as a direct-to-DVD movie. I really, really wanted the movie to stay focused on Lightning. Seeing him deal with the transition from a major player on the Nascar circuit to being considered an outsider/underdog in the Grand Prix could have been an interesting story, and it would have felt much more like a follow-up to the first movie, and his introspective lesson about accepting his friend for who he is would have been a lot less disingenuous (especially if it had been given time to develop, instead of spelled out in a couple lines of dialogue). Plus, animation-wise the first movie was most impressive in its racing scenes. They were visceral and exciting and felt like there was really something at stake. In theory the stakes in the sequel’s races should have felt even higher, but instead they were an unresolved afterthought. But I think my biggest disappointment was how commercial the movie was. It felt like it was only made because the first one was Pixar’s biggest merchandising success, and shifting the focus to the most popular character means more toys sold. On that front it will work – my 2-year-old loves Mater and she loved the movie. But up until now Pixar has made family films, not kids movies. Hopefully the cash they rake in from this will be used to finance the higher-quality films we’ve come to expect from them. I wouldn’t have a problem with it if it were, in fact, a true character arc. Specifically, if Mater suddenly realized who he was and that he would have to change, then I might be a little more satisfied. As it is, his realization has more to do with HOW he is viewed than WHY he is viewed that way. And this realization is meant to make us sympathize more with him and feel bad about ourselves as audience members for laughing at him. By the end of the film, all of the other characters wind up apologizing to Mater for the way they treated him. He hasn’t been required to change at all. All that is to say that, no, I thought any realization Mater has is less a function of the character and more a function of the filmmakers and their attempt to give a sub-par film some last minute depth.